For the first time in my life, I got to board an international flight — and turn left. At some point I think that’s really what it’s all about, that moment of ego gratification from getting to sit up front. At least it was for me, since I’d never been up there before, and I used Frequent Flier miles to get there, and I probably won’t be up there again any time soon. By the way, if you’re wondering how I got all those meals, it’s simple: leading overseas hiking trips and travel hacking, mostly with this guy. So for me, yeah, turning left was cool. So was seeing the little cubicle-seat and knowing it was all mine. And having basically a whole luggage compartment to myself. And having the lady come around and offer me a drink before I even got settled. A drink and a menu, mind you. Well, now. 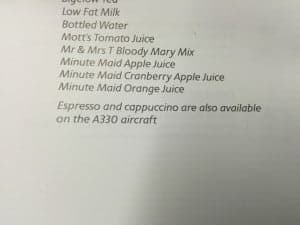 Your drink and menu, sir! So sure, kicking back, stretching my legs out, sipping sparkling water, and contemplating whether I want the chicken, steak or fish … It’s pretty nice. I got the fish, by the way. The pistachio-encrusted tilapia, that is. Then I spent some time being the total first-timer goofball that I was, fussing with the remote control and opening all the little compartments and enjoying, way too much really, the little button that makes the seat lay back and go all the way flat. About that lie-flat thing. I’m 6-1, and yes, I could stretch out. Couldn’t really lie on my side too well, at least not with my legs bent. And it was only a six-hour flight, Philly to Heathrow, with two meals, so it’s not like a got a long, comfortable sleep. And yes, the above paragraph should get a framed spot on the Complete Lack of Perspective Wall of Fame. Two nice perks on arrival: A pass for the Arrivals Lounge (I didn’t go) and one for the Fast Track Line at Customs. That was much appreciated! And this was a nice touch at breakfast! 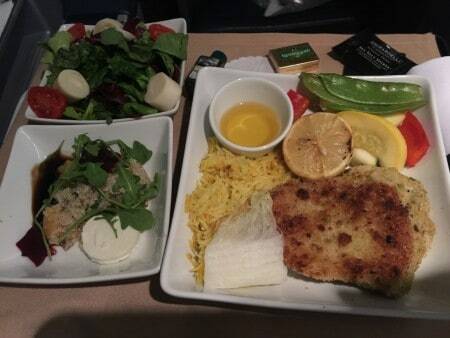 So I would say that sure, International Business Class is a lot more comfortable than anywhere among the right-turners, and the food is better. But, even after doing it, I’m not sure it’s worth the cost. 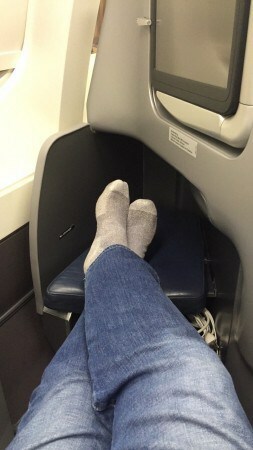 In my case, I plunked down 20,000 extra frequent-flier miles each way to sit up there. Those miles could have gotten me a roundtrip ticket to anyplace in the US. What would you rather do: stretch out your legs on a trans-Atlantic flight or take a trip to someplace like Miami? 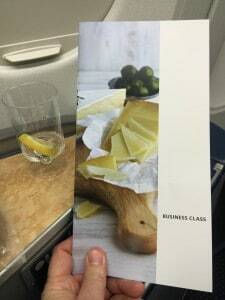 Or, when I look at my 120,000 United miles, would I rather sit up front once, or take two trips to Europe? Anyway, it was a fine start to another English soccer trip. Might have to try it again someday.